WESTFIELD, Mass. 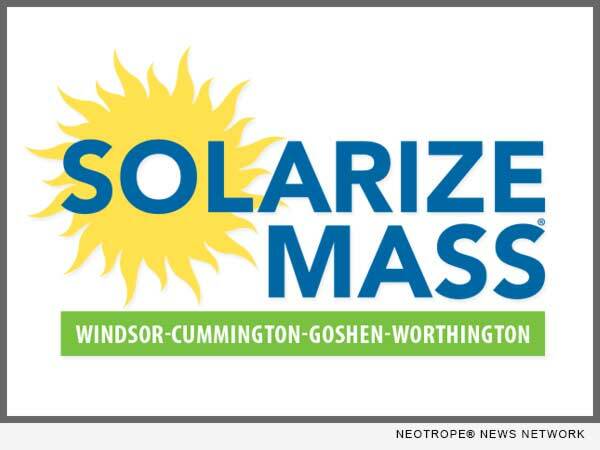 /Massachusetts Newswire/ — SunBug Solar is proud to announce the completion of the sign-up phase of the Solarize Windsor, Cummington, Goshen and Worthington (Solarize Mass WCGW) initiative. Solarize Mass WCGW is part of a Solarize Mass, a partnership between the Massachusetts Clean Energy Center (MassCEC) and the Green Communities Division of the Department of Energy Resources (DOER) that encourages the adoption of small scale solar in Massachusetts communities. Since its launch in 2011, 62 cities and towns have participated in Solarize Mass. This has led to the contracting of more than 3,500 new small-scale installations at homes and businesses, amounting to the installation of over 21.4 megawatts of solar power. Solarize programs offer discounted solar installations to community members based on tiered pricing; the more people that sign up, the lower the price. Through the hard work of Solarize volunteers and the SunBug team, Solarize Mass WCGW surpassed the highest pricing tier, resulting in the lowest possible prices for all customers. Over the six-month timeframe, SunBug signed up 90 families representing 767kW of solar. The 767kW of solar installed through this program will have a meaningful environmental impact. Every year, 767kW of solar on the grid will reduce CO2 emissions equivalent to driving over 760,000 miles in an average car. Over the 30-year life of the systems, they will avert the CO2 emissions equivalent to what nearly 9,000 acres of US forest can sequester in a year. In addition to the environmental impact, these solar systems are going to be a significant financial boon for the families participating. In Massachusetts, residential solar PV systems have two compensation streams; savings from your electric bill, and compensation from the sale of Solar Renewable Energy Credits. Over the 30 year estimated lifespan of the PV systems, they are expected to generate over $9 Million for the families. What’s more, this figure does not include ancillary financial benefits of solar, such as increased re-sale value of the home. The Solarize campaign is based out of SunBug’s new office in Westfield, Mass. In coordination with SunBug’s headquarters in Arlington, the Westfield office is executing sales, operations, and installations for Franklin, Hampshire, Hampden, and Berkshire Counties. SunBug’s expansion to the western part of the Commonwealth is an important step forward for a growing organization with strong Massachusetts roots. SunBug Westfield is the result of years of hard work and planning-both in terms of SunBug establishing itself as the highest rated solar installer in Eastern Massachusetts, and for the strategic timing and location of its new office and warehouse. Founded in 2009, SunBug Solar is as a mission-driven organization-a company that seeks to simultaneously do right by the customer, the community, and the environment. Today, with 75 employees and over 1,000 solar installations throughout the Bay State, SunBug Solar is bringing its unparalleled reputation for quality and customer satisfaction westward. SunBug’s commitment to service is recognized by independent industry watchers, including Angie’s List, who has awarded SunBug their coveted Super Service Award every year since 2012, making SunBug the sole Massachusetts-based company to have won this award five years running.